21-Sep-2002 -- We decided to go for this confluence in order to get some practice for the trips to come. We started in the early afternoon in our hometown of Bielefeld on a quite cloudy day. Bielefeld itself has only a “secondary secondary” confluence at 52N 8,5E within the city limits. So 52N 9E - the only confluence in “Regierungsbezirk Detmold” and in Lippe County – was our target today. 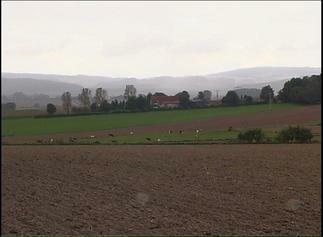 We approached by passing the citys of Lage and Lemgo and than heading ESE on the B239. After about 5 km from Lemgo we turned left into a residential area with only 1300 m distance to our destination. Then we took the next road to the left seemingly to be the shortest way. But it was a dead end and so we went back and then drove trough the small town of Hagen Donop then abot 500 m to the north, when another road to the left seemed to be the right way. When we were only 200 m away from the confluence we left our car behind, hiking a short distance on a field road and then right across a field, which was freshly ploughed, but dry. We finally reached 52N 9E at the opposite side of that field only a few meters away from a small thicket. The confluence is located in the “Lippisches Bergland” region the surrounded by farmland and woods. To the north lies a farmhouse and to the south you can see a wind wheel in the distance.